Puzzle Cubicle is a pure puzzle game with a twist on the traditional formula: you don't know what you're trying to reproduce. Challenging? Satisfyingly so! Don't worry; we give you hints and restrictions so you can use your head and figure out the solutions. With a varied range of difficulties, 50 puzzles and an original soundtrack, this is more than enough to satisfy the puzzle lover in you! 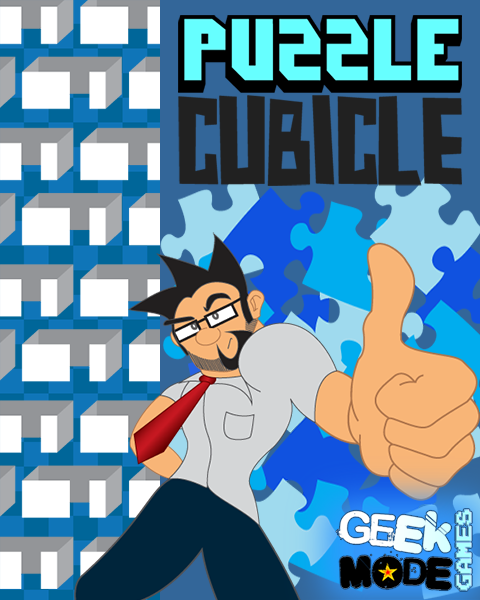 Enjoy Puzzle Cubicle and many other great games on Desura. Puzzle Cubicle released on XBLIG! Puzzle Cubicle, Geek Mode Games' first attempt at making a video game came out on XBLIG earlier today. Love this game and I pinned it to my Pin Interest board - if you do add more puzzles let me know so I can update my board - I have a lot of followers so they'd be interested in keeping up with any updates. Sorry for the late reply, but I just noticed your comment. Thank you very much! If we ever add any puzzles or update the game in any way, I'll let you know right away. Looks interesting, but can you make your own puzzles? The simple answer is no. There are 50 puzzles overall and 30 of them are in the medium and hard difficulty (meaning it should take most people quite a long while to get through all of them), but as for users creating new ones, no puzzle editor has been made. RT @MatPiscatella: Do gamers actually like video games?